More than 2,000 teachers from Delhi University, Jawaharlal Nehru University (JNU), Indira Gandhi National Open University (IGNOU), Jamia Hamdard and Lal Bahadur Shastri Vidyapeeth sat on a dharna and hunger strike outside the UGC office. at the outlet that proved to be fatal for the robbers. A 20-year-old girl died here, when her head hit an electric pole while she was peeping out from a bus window. Two youths were wounded in an incident of indiscriminate firing by gun wielding bikers in Sarfabad village on Wednesday. With the demographic transition and the disintegrating value system, our society has turned turbulent, with our younger generation accepting new family trends and the greying section being subjected to the changing lifestyles, which it finds hard to acclimatise itself to. For Divyajyoti Jaipuriar, commuting had become a daily nightmare as a road next to his North Delhi house had been dug up and left unattended for nine months. Delhi Pradesh Congress Committee (DPCC) president Jai Prakash Agarwal has exhorted the MLAs and municipal councillors to start working in earnest to ensure the victory of the National Students Union of India (NSUI) candidates in the Delhi University Students Union (DUSU) elections. While the Employees State Insurance Corporation of India (ESIC) has been granted permission to open nine medical colleges on its campus in Delhi, it would also start providing free maternity services to the wives of all unorganised workers. With the arrest of Ram Lal, Ashok, Deepak and Heera yesterday, the Outer district police claims to have busted a gang of notorious vehicle thieves. The Delhi Development Authority (DDA) for the first time has come out with in situ “Slum Rehabilitation Scheme” whereby a number of JJ dwellers will be rehabilitated with all civic amenities near the area where they have been living in jhuggi-jhonpris for years. Chief Minister Sheila Dikshit, visiting to New York next month to attend a function, will highlight how tree plantation and CNG use have helped control pollution in Delhi. The Municipal Corporation of Delhi (MCD) today started the implementation of the National Policy on Urban Vendors with the beginning of allocation of tehbazari sites in West Zone. Water supply in areas of Sunlight Colony, Sidhartha Extension, New Friends Colony, Sarai Julena, Sukhdev Vihar, Jamina Nagar, Zakir Nagar, Batla House and Noor Nagar was affected with a sudden burst of the main water supply line near CNG filling station at Sarai Kale Khan on the Outer Ring Road. Ghaziabad will soon have a Sports City spread over 92 acres, which will be developed by an internationally reputed Malaysian company. Big 92.7 FM’s radio jockey (RJ) Dheena has broadcast live on radio continuously for 168 hours and entered the Guinness Book of World Records, bettering the previous mark by 33 hours. 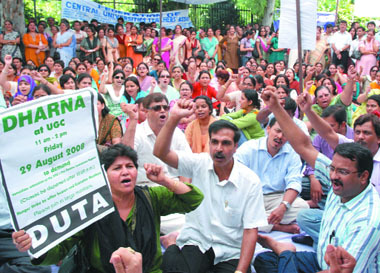 The dharna was organised by the FEDCUTA and was held across many central universities in country. Teachers had gathered to register their anger over their delay in the submission of the UGC pay revision report for university teachers. The delegation strongly urged the chairman not to grant any extension to the pay review committee, the tenure of which is coming to an end on September 5 this year, and pressed for an immediate submission of the report. Teachers stressed that if the higher education system has to deliver and accelerate the socio-economic development, the system must attract and retain talent in teaching profession. FEDCUTA has urged the UGC chairperson for an early decision on initial higher initial pay at the entry level for lecturers and fast and sound career advancement scheme including professorship/professor’s grade in colleges, better facilities to faculty for academic advancement and research and adequate working conditions. After pulling off almost a perfect robbery by putting a knife on the neck of the victim and withdrawing money from his account at an ATM outlet, it was the camera installed at the outlet that proved to be fatal for the robbers. Hutesh Sharma, 22, Viru, 22 and Vinod Sharma, 23, were today arrested by the Sarawati Vihar police for a sensational Ring Road robbery case. A robbed gold chain, five mobile phones, one motorcycle and one Maruti Zen car used in the crime were recovered at their instance. On August 6, Arminder Kumar Yadav, 23 was waiting for bus at the Ring Road Wazirpur depot, when the three accused in a Maruti Zen car offered him lift up to Lajpat Nagar. Amrinder, who did not suspect anything foul, got into their car at about 8.30 pm. After covering some distance, gang leader Hutesh, who was sitting on the back seat beside Arminder, put a knife on his neck and robbed him of his wallet containing Rs 1500, a gold chain and a mobile phone. While searching Arminder’s wallet, the accused found his ATM card. They then drove their car to the Karol Bagh area and forced him to disclose his pin no. Hutesh withdrew the total amount of Rs 13,200 from the account. They then dumped Arminder some distance away. During the course of investigation, inspector Ajay Kumar collected the CD of the CCTV installed at the ATM outlet of State Bank of Bikaner & Jaipur from where the accused had withdrawn the cash. 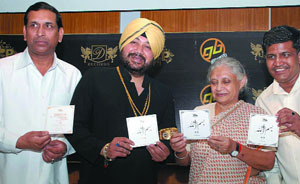 The photograph developed from the CD was shown to the informers, who tipped the police about the movement of the accused. They were finally nabbed from village Karala on the outskirts of the Capital. Delhi may be aiming to become a world class city for the 2010 Commonwealth Games, but it lacks basic amenities like public toilets for women, reveals a report by a college student that has compelled the Delhi High Court to direct civic bodies to provide better public conveniences. Shahana Sheikh, a final year student of economics at Lady Sri Ram (LSR) College, undertook a tour of slums and the outskirts of Delhi from May to July 2008. According to Sheikh, the Municipal Corporation of Delhi (MCD), in its 2007 report, claims that there are 3,192 public conveniences in the national capital but she found only 1,534 toilets during her survey. In her report titled “Public Toilets in Delhi - An emphasis on the Facilities for Women in Slum Areas”, Sheikh says only 132 urinals are available for women and most of them are in a dilapidated state. “A man has options but a woman can’t urinate in the open as that is deemed ‘uncultured’. The issue of public toilets affects women the most, especially poor women,” Sheikh told IANS. A division bench comprising of Chief Justice Ajit Prakash Shah and Justice S. Muralidhar Wednesday asked the MCD to take note of Sheikh’s recommendations and compile a detailed report within four weeks. According to Sheikh’s survey, there are only 14-16 toilets for 40,000 people in Sanjay Colony near Okhla. In Kusumpur in the Vasant Vihar area, there are only 30 toilets for a population of 30,000. Similarly, Rajiv Camp in the Trans Yamuna area has 15 toilets for a population of 3,000 people and Madanpur Khadar has 302 for 150,000 people. “We are preparing ourselves for the Commonwealth Games and it’s horrible that the city’s civic agencies do not even perform their basic duties. It’s a violation of the rights of citizens, especially women, who have no option but to defecate in the open,” advocate Ashok Agarwal, who is a counsel in the case, said. Sheikh prepared the comprehensive report as part of her summer internship with Centre for Civil Society, a city-based research organisation. The 98-page report has numerous interviews Sheikh conducted with senior MCD officials during June and July 2008. “Officials from the slum department of the MCD said the norm in slum areas is one latrine seat for 150 people and a 20-20 (20 latrine seats for men and 20 latrine seats for women) for a plot meant for 500 households,” the report states. Sheikh has recommended that “the MCD should make it mandatory for companies, who show interest in constructing, repairing and maintaining toilets on a BOT basis in lucrative areas, to also do the same in slum and resettlement areas”. The bus was chartered by Motherson Company located in Noida’s Sector-6. Ambika Chaturvedi from Amroha lived in West Vinode Nagar in Delhi and was employed as a helper in Motherson Company. She had occupied a window seat in the staff bus (No. DL-1 PC-1053) while returning home after her duty. There were 25 other company staff in the bus. When the driver was reversing the bus, a side of its rear part hit an electric pole. As Ambika’s head was protruding out from the bus window, it hit the pole with force. By the time the driver could stop the bus, Ambika’s head was bleeding profusely. She was rushed to Kailash Hospital in the company’s ambulance, where she was declared ‘brought dead’. However, in a shocking display of indifference, Ambika, who worked for Motherson for many years, was admitted by the company staff as an ‘unidentified woman’. Her family was not informed about the death. Only her uncle was told that Ambika had lost a hand in an accident. Sector-20 police has seized the bus and is questioning the bus driver. Out of the two, Rakesh was the actual target while the other, Naresh, received bullets while he was standing at a betel shop at the spot. Rakesh, who was attacked because of personal enmity, sustained seven bullet injuries while Naresh was hit by four bullets. The incident took place at about 12 in the noon, when Lakhan, with his accomplices reach there on bikes and started raining bullets on Rakesh. The miscreants sped away after the incident. Rakesh’s family members reached the spot and rushed the two to Kailash Hospital in Noida. Rakesh is said to be in a more critical condition. However, both of them are said to be out of danger now. The police is yet to record Rakesh’s statement. However, he has identified Lakhan Yadav as the assailant. According to the police, Lakhan alone fired shots on Rakesh and Naresh. There was a long-standing enmity between Lakhan and Rakesh. The police has raided a number of hideouts, but Lakhan is still at large. This was the consensus at a national consultative meet on ‘Safeguarding Rights of the Elderly in India’ organised by the National Institute of Social Defence (NISD) of the ministry of social justice and empowerment and Anugraha, an NGO working for the destitute and the needy. The meet was held at the Scope Convention Centre in the Capital, in the context of the Maintenance and Welfare of Parents and Senior Citizens Act, 2007. Justice Gita Mittal of Delhi High Court, who was the guest of honour, discussed the plight of senior citizens and highlighted the various statutory points for the maintenance of the well being of the senior citizens in India. India has a great tradition of respecting the elderly. But with the fast pace of modernisation, the traditional societal structure has begun wilting. In this respect, he stressed upon Article 21 that talks about their right to live with dignity, which is beyond just their maintenance and welfare. Joint secretary of ministry of social justice and empowerment, government of India, Arvind Prasad apprised the audience about the bare provisions of the Act. He declared a series of sensitisation meetings in different parts of the country to make people aware of the Act. Aabha chaudhary, founder of Anuragha, reiterated Anuragha’s commitment by announcing the launch of legal aid and counselling cell, helpline and other social support services which will be provided free to needy older people. Notable issues impacting human rights, safety and security of senior citizens were also discussed threadbare. Among the panelists, Sajjan Singh outlined the relevance and the impact of the Act, emphasising upon the necessity of revival of Indian cultural traditions and family values so that a happy and dignified life for the gray generation is ensured. The purpose of the meet was to enhance public awareness and knowledge of human rights of the elderly people, while debating upon the key provisions under the maintenance Act. The thrust was to identify those areas where the bill lacks and the necessary amendments that could better the scenario for the older citizens in India. However, there were some like psychology professor N. K. Chadha of Delhi University, who is perplexed about the purpose of the bill. He feels that anyone can’t be coerced to take care of someone. The bill might not foster goodwill, bridging the gap between the two generations rather would widen it. But it took just nine days for the same civic authorities to repair it - thanks to the Right to Information (RTI) Act. “The road near my house was dug up in October last year for some drainage work. However, after the work was done, the road was left as it is, causing problems to residents,” Jaipuriar, a high court lawyer who resides in Vijay Nagar, said. Finally, he filed an application under the RTI Act asking the Municipal Corporation of Delhi (MCD) to give him details about the repair work carried out. “To my amazement, within nine days of my filing the application, the road was repaired perfectly. This is the power of RTI,” he said. Interestingly, the lawyer has till date not received any answer on his application. According to data procured by NGO Kabir, more than 46,000 RTI applications were filed at various government departments in the Capital from October 2005 to December 2007. These departments included the Delhi police and the housing agency DDA. “This was the figure up to December 2007. But now with people becoming aware of RTI, I suppose the number of people using RTI must have gone up,” said Neeraj, who works with Kabir. In a similar case, a resident of Northeast Delhi filed an RTI application asking for the details of a road, which was being made by the civic agency. The elections are to be held on September 5. The NSUI candidates for the DUSU elections—Sonia Sapra for the post of president, Manohar Nagar for the post of vice-president, Amit Choudhary for the post of secretary and Ashish Gehlot for the post of joint secretary—were also introduced at the function. Agarwal said that the NSUI had fought for the rights of the student community and so its candidates should elected to responsible posts in the DUSU elections. He said Delhi University was the most prestigious in the country as brilliant students from all over the country and abroad came to pursue quality education. The DPCC president exhorted the Congress leaders and workers to keep in touch with the NSUI candidates in their respective areas and work towards their victory. Sources said the DUSU election was very important for the political parties as its result would be an indication of the mood of citizens of the Capital in the assembly elections to be held in November. AICC general secretary Mukul Wasnik said the NSUI would once again sweep the elections as it had done last year and would defeat the communal and casteist forces, who have been vitiating the campus atmosphere with destructive politics. Oscar Fernandes said the NSUI also would ensure process all facilities and rights for the student community. The NSUI was known for its responsible, constructive campus politics and it created a conducive atmosphere in the university. This was jointly disclosed by union labour secretary Sudha Pillai and ESIC insurance commissioner B C Bhardwaj at Health Insurance Summit organised by ASSOCHAM. Speaking at the summit, Bhardwaj said the government, in consultation with the Indian Medical Council, had recently given approval to the ESIC for opening nine medical colleges in the Capital to help overcome the acute shortage of qualified doctors both in the government as well as private hospitals. He said the ESIC had enough buildings and space in its possession to open these colleges. There was only a need to set up proper, state-of-the-art laboratories for these colleges and he hoped that these would start functioning by October 2009. Pillai said a Cabinet note would be moved next month to extend the scope of the Rashtriya Suraksha Bima Yojana to cover the wives of unorganised workers and to provide free maternity benefits to them at all ESIC hospitals. The labour secretary said the Rashtriya Suraksha Bima Yojana was gradually picking up as over 20 states had agreed to provide insurance benefits to crores of people below the poverty line. Currently, the scheme is getting kicked off in and around Delhi and it would get more popular with time. The smart card the government would provide to the labour class and particularly to people living below the poverty line would enable them to seek proper medical facilities at all ESIC-run hospitals. Four stolen motorcycles (3 Pulsar and 1 TVS Victor), stolen from areas of Nangloi, Uttam Nagar, Paschim Vihar, and Gurgaon, were recovered at their instance. The police claims that with their arrest, a total of 20 cases of motor vehicle theft had been solved. The arrest was made by a police team especially constituted following frequent reports of vehicle thefts in the area of Nangloi. During a checking, four persons on a Pulsar motorcycle (No. DL-4S AY 1554) coming from the side of Najafgarh were stopped. On questioning, it was found that the motorcycle was stolen form the area of Nangloi three days ago by the four of them with the help of their other accomplices. On sustained interrogation, the accused disclosed their involvement in 20 cases of motor vehicle thefts committed in different areas of the Capital and Gurgaon. They used to steal motorcycles, cars and tempos. They would park stolen vehicles in a place in Najafgarh and struck deals to sell them in Delhi, Uttar Pradesh and Haryana. 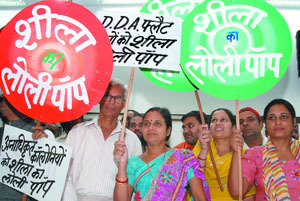 The DDA has taken this initiative for rehabilitation of Slum & JJ dwellers which is a departure from the earlier resettlement schemes wherein the jhuggi dwellers were shifted and settled at far-off places from their places of occupation and residence leading to unemployment and other related problems. Under the scheme, resettlement will be done on the land occupied by JJ clusters with private partnership. The land will be sold through tender process to a private partner for construction of multi-storeyed houses. A spokesperson said that for the purpose of rehabilitation, the DDA has already identified 21 clusters. These clusters are located at Kathputli Colony spread over an area of 5.22 hectares (ha), Jailerwala Bagh spread over an area of 10.2 ha, Block E & F, Sector 18, Rohini on 3.02 ha and Camp 2, Keshopur, Vikas Puri on 0.7854 ha. There are about 5500 JJ units eligible for rehabilitation in these clusters. Dwelling units with carpet area of about 25 sq. meters will be provided. Prequalification applications invited in case of four colonies are likely to be received by September 20. Financial bids of the shortlisted pre-qualified applicants will be invited by October 22 and the agency to take up the development work, will be decided on November 30. The work will actually start by mid-December. The DDA has also appointed consultants for the purpose and so far 10 consultants have been appointed. The consultancy includes survey of the site, physical verification of the number of existing slum dwellers, clearly identifying the eligible slum dwellers or squatters from pre-1998 and post-1998, socio-economic status survey, preparation of the scheme for optimum utilization of land as per approved policies and framework of Master Plan, 2021. It will also indicate the technical and financial viability and suggestion for any relaxation or exemption, if required. Tendering documents with the modalities of the PP model will also be provided by the consultants including exploring the possibility of subsidy. It may be mentioned that Master Plan – 2021 has provided for in situ slum rehabilitation with enabling provision of 400 FAR as compared to 133 earlier and a density of 600 dwelling units per hectare as compared to 175 per hectare earlier. It is in pursuance of this provision in MPD-2021 that the schemes have been taken up. The rehabilitation of other clusters is also likely to be finalized soon. Delhi is the biggest city in the world where buses and other vehicles use CNG as a fuel, resulting in air pollution level coming down to a great extent. She will go to New York on September 23 to attend a seminar on greenery and other issues related to pollution, sources said. The Chief Minister said planting of one million saplings every year in Delhi has resulted in an expansion of the green area, which has earned it the distinction of being the greenest Capital-city in the world. The credit of this feat goes to school children, contributing substantially through more than 2,000 eco-clubs functions in educational institutions. Inaugurating a plantation drive and addressing school children in the Research and Referral Army Hospital at Delhi Cantonment, the Chief Minister said around 250 saplings were planted in her presence. She complimented role of Army personnel who undertook a major project of greening of Bhati Mines by planting more than seven lakh saplings over a five-year period. The Bhati Mines area, which used to be rocky and barren, has now become green. In Delhi, 18 agencies are involved in the greening exercise. The government has developed 32 city forests, which has ensured clean air and a soothing natural ambience. Apart from this, more than 500 retail centres of Mother Dairy, CNG and petrol stations and kendriya bhandars are also being utilised for the distribution of free saplings during the greening season. School kids presented a colourful cultural programme on environmental protection. The process of allotment of these sites was started on the guidelines issued by the Supreme Court. In the first phase, approximately 10,000 applicants are being allotted sites. The size of each tebhazari site is 24 square feet. With a view to providing aesthetic appearance, stalls of uniform designs are being provided. The permissible items of trading will be non-prohibited articles. Cooking is not permissible at these sites. Tehbazari is a major issue in Delhi and this case was taken to the Supreme Court by someone when the MCD had submitted a scheme for vendors. Later, the court approved the scheme of the MCD. The incident took place in the afternoon. Employees of the Delhi Jal Board are at work to repair the pipeline. The repairing work would be completed within a few hours, a said a senior official of the Jal Board. When executive engineer, Delhi Jal Board, Preeti Pant, was contacted she said Sarai Kale Khan was out of his jurisdiction. She further said that the majority of the pipelines are old. They have defect. They should be replaced. Same was said by the Sancham Cheema, spokesperson of the Jal Board on Wednesday when a water pipeline burst that day at Kilokari village. Today’s incident is the second one of the same kind in a week. Ajit Singh, the president of the Malaysian company, Namphat, had a meeting with vice-chairman of the Ghaziabad Development Authority S.K. Divedi two days ago. The international standard complex is likely to come up near Morta on Meerut road. The Sports City will have all facilities and infrastructure of international standard for various sports like athletics, cricket, football, hockey, rugby, badminton, lawn tennis, swimming and many more. The sports complex, which is being touted to be the most modern in the country, will have both indoor and outdoor stadiums. The stadiums and the grounds will always be available for practice and training. Divedi said that Ajit Singh has expressed his desire to develop the sports complex. Namphat is known world over for developing top class institutes for sports. “We are trying to provide the best infrastructure and facilities for sportsmen in Uttar Pradesh,” V-C said. He is “ecstatic” after breaking the existing world record of 135 hours set by Italian RJ Stefano Venneri in 2007. Though Dheena, who hosts ‘Big Vanakkam’ on Big FM’s station at Chennai, broke Venneri’s record at 8:01 p.m. on Tuesday itself, he continued on to set a new record which would be tough to break. “I didn’t want to be a sprinter. I wanted to be like a marathon runner who would lead by hours and I have done that. I wanted the target to be very high so that for the next between five and 10 years, no one should even think of attempting this,” Dheena said. This was not the first time Dheena attempted an on-air marathon. In August 2007, he had worked non-stop for 92 hours and seven minutes. For his Guinness record, the FM station ensured all medical requirements for Dheena. A team of physicians was present to monitor his health.